For the first time, genome sequencing has been carried out on Chlamydia trachomatis (C. trachomatis), a bacteria responsible for the disease Trachoma - the world's leading infectious cause of blindness, according to a study in Nature Communications. Researchers at the Wellcome Trust Sanger Institute and Menzies School of Health Research, Australia have discovered that genes can move from chlamydia strains in the eye to sexually transmitted strains of chlamydia, allowing them to then infect the eye and cause Trachoma - a neglected tropical disease. C. trachomatis is the major cause of sexually transmitted infections (STIs) worldwide and is also responsible for trachoma. Trachoma affects about 2.2 million people worldwide, and is still present in some Indigenous communities in the Northern Territory of Australia. The clinical impact of the results is that trachoma re-emergence may be more likely than previously thought, particularly if Chlamydia STI remains common. Dr Patiyan Andersson, Senior Research Officer at the Menzies School of Health Research (Menzies) and lead author of the paper, said: "This work came about from the analysis of frozen isolates that had been collected in the 1980s and 1990s. 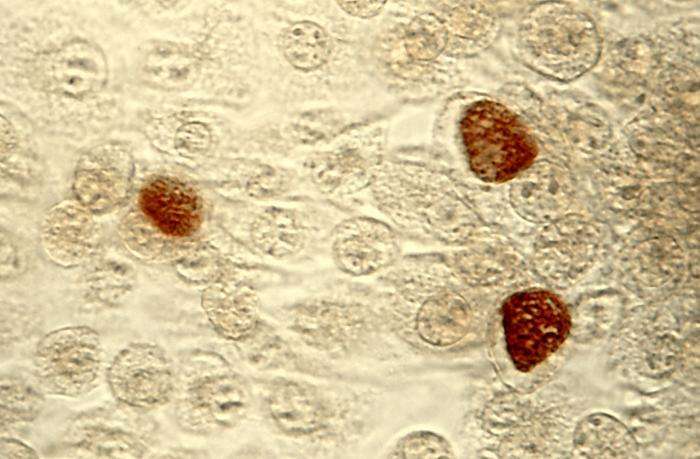 We were able to resuscitate chlamydia bacteria that had been frozen for 30 years, and study their genomes to find out how they had evolved." The study has resulted in a major change in the understanding of C. trachomatis evolution. It was previously believed that the different version of Chlamydia that caused trachoma were a completely separate lineage from those that cause STIs, this research team has proven otherwise. The team has provided strong evidence that the acquisition of just one or two gene variants can change an STI causing strain into a Trachoma associated strain. Because it is also now known that Chlamydia can readily exchange DNA this shows that there is a continued potential for new variant Trachoma strains to emerge. The study was led by Professor Nick Thomson from the Welcome Trust Sanger Institute and Associate Professor Phil Giffard, from Menzies, with important contributions from researchers at the Chlamydia Biobank at the University of Southampton. Associate Professor Giffard said: "The sequences of these strains were the biggest surprise of my scientific career to date - they were completely different to how they 'should' have been. Surprises are what every scientist hopes for. It was very rewarding to work with the same researchers who collected these strains in the Northern Territory in the 1980s, three of whom contributed even though retired, and also to work with our superb collaborators in the UK." The outcome of this study demonstrates the huge value of long term storage of clinical and biological material, and its analysis with modern high technology. There remain many important unanswered questions about C. trachomatis, which in many ways remains an enigmatic pathogen. However, this study has revealed some of its secrets. Professor Nick Thomson, group leader at the Wellcome Trust Sanger Institute, said: "Genomics has not only unified scientists across the world it has also challenged commonly held beliefs that make us rethink how we are tackling important diseases that have dogged human kind for centuries. Trachoma is a neglected tropical disease and one where the clear benefits of a combined skill set, using both classical and cutting edge techniques, have provided novel insights that are of immediate importance for tackling this disease."